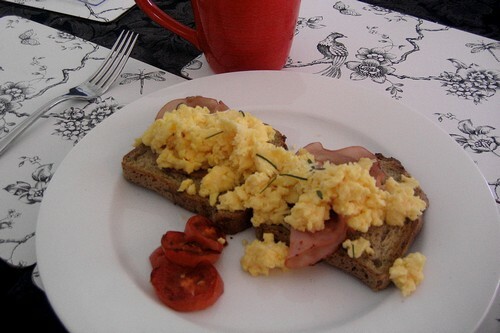 Scrambled egss and ham on gluten free herb and garlic bread with home grown tomatoes and chives. I’m not normally a fan of gluten free bread and just make do without, but last night I purchsed Vitality brand Herb and Garlic bread from Macro Wholefoods. It kinda has not much taste which in my mind is much better than the taste of some of the other GF breads! Even better – it’s made just down the road!